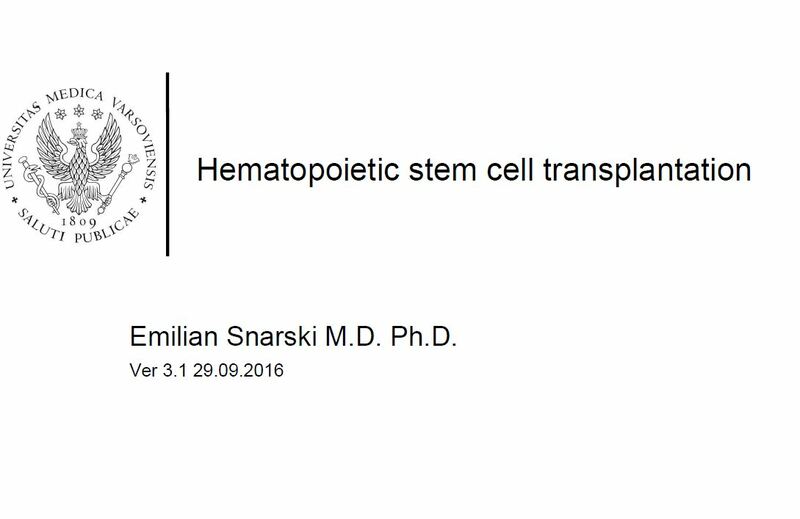 Bone marrow transplantation AD 2016 | Emilian Snarski M.D. Ph.D. I have just had my presentation on bone marrow transplantation for students. It includes some new things compared to the presentation from last year. The presentation is available to download here. Thank you for sharing and the great insight it gives. The Berlin patient is very interesting..my old treating Immunologist would always say to me that HSCT will not alter my genetics and hence disease would remain for me…for example I m HLA-B27+ and have a long disease list of autoinflammatory/ autoimmuniological symptoms attributed …a transplant mixing non HLAB27+ Donor stemcells ..what would that do? I echo your hope that one day soon BMT will no longer be needed.